The recent history of the March of Brandenburg has been a sad state of affairs. With poor soils, swamps and wild forests Brandenburg is not the richest lands of the Holy Roman Empire and under Wittelsbach and Luxemburg rule the region has been treated as a source of quick income. 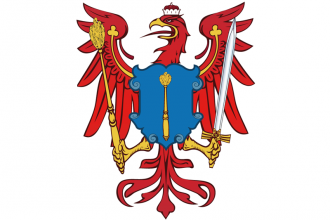 With the ascendence of the Hohenzollern Dynasty things have slowly begun to change. Friedrich I spent his entire reign wearing down the influence of the Brandenburg estates and fighting the prevalent lawlessness, sending his armies against the castles of the many robber barons that have for long had a free reign over the region. In many ways Friedrich II, 'the Iron', has proven to be his father's son, resuming the policies intended to crush the power of local potentates and greedy burghers. He has also sent out feelers to the Teutonic Order for the reclamation of Neumark, a land originally part of Brandenburg, but pawned by his predecessors. The difficulty in asserting state power is amply demonstrated by the Kalmar Union kingdoms of Denmark, Sweden and Norway, were a king attempting to achieve similar goals was recently deposed and replaced by a Bavarian Wittelsbach. If Brandenburg is to be made a durable state it must also remain united, avoiding squabbles like those among the Wettin heirs in Electoral Saxony to the south. The nearby kingdoms of Poland and Bohemia are both without rulers in 1444, one as a direct result of the failed Crusade of Varna against the Ottomans, and the other due to the rejection of the Habsburg heir Ladislaus the Posthumous by the Bohemian nobility. Despite the Bohemian lands still not having recovered from the Hussite wars of the last decades the Heretic Hussites remain a strong factor in Bohemian politics, making the kingdom a cause for concern among all its neighbors, Brandenburg included. Brandenburg shares many of its missions with Prussia. There is only one king in the Empire, the king of Bohemia. At the same time our lands in Prussia are not a historic part of the Empire, let us declare ourselves King in Prussia to reflect our grander status than the other electors. Brandenburg is a duchy located in the German region. In 1444, it borders Mecklenburg and Pomerania to the north, Teutonic Order and Poland to the east, Bohemia and Saxony to the south, Brunswick to the west, and three OPMs. Brandenburg starts as an Elector of the HRE, six provinces that total 55 development, and a chance for an event that allows to buy Neumark from the Teutonic Order for 100 Ducats, if Brandenburg has less than 3 loans. It starts in a good position to form either Prussia or Germany. Playing Brandenburg can be challenging during the first 20 to 30 years after a 1444 start. It is quite luck-dependent, and requires good allies to grow in this early period. Depending on the intended strategy, consider restarting the game if Poland starts as a rival. There are a few missions for Brandenburg which give claims on neighboring provinces. Even if these missions let Brandenburg expand rapidly, aggressive expansion may accumulate quickly, eventually leading to a coalition if not managed correctly. One way to start with Brandenburg is to ally Saxony, Brunswick, and Mecklenburg. Brandenburg should then attack Pomerania. It is important to secure control over Pomerania's capital, as it should be made into a vassal. In most cases, Pomerania has no strong allies. However, they occasionally ally with stronger countries such as Hungary or Denmark. Brandenburg and its three recommended allies will have no navy whatsoever, so land warfare must be the primary focus instead. Assuming that Pomerania does not have any strong allies and Brandenburg sues for peace out before 1446, getting a stronger ally, like Poland, can be accomplished quickly by building up to force limit and improving relations. Another way to expand which doesn't involve running into problems with aggressive expansion is to move eastwards after subjugating Pomerania and attacking the monastic Teutonic and Livonian Orders. One thing is very likely to happen: Poland will attack the Teutonic Order. If this happens around 1448, Brandenburg should wait for their war with Pomerania to end before securing an alliance with Poland. Once the alliance is secured, Brandenburg must declare war on the Teutonic Order. Don’t attack the Order until Pomerania becomes Brandenburg's vassal. The player should attack the Teutonic Order the moment the peace is signed with Pomerania in order for Brandenburg to seize provinces from the Teutons before Poland annexes them. By the time the war against the Teutonic Order is over, Brandenburg can raise an army with around 20 units and build enough ships to create a decent fleet. A period of peace should present itself until a second war with the Teutonic Order is waged, or until most of your aggressive expansion has ticked away. At this point, Brandenburg should have a very low aggressive expansion rating in central Europe, which opens options to change allies. Austria is a good choice, and Denmark, if not a rival, is another. Brandenburg should then be in a good position to attack the Livonian Order, and either seize their territory or make them a vassal. From now on the strategy is completely up to the player since the situation varies from game to game. However, it is recommended to finish expanding into Novgorod, and then slowly expanding into the German region in order to be able to form either Germany or Prussia. An alternative strategy the player can attempt is to conquer fast. Its possible to vassalise Saxony right at the start as in most cases, Saxony doesn’t get strong allies (if they do, restart the game) and it's possible to win a quick war. Like in the first strategy, it´s important to always ally with Poland. The aggressive expansion for vassalising Saxony is huge, but not enough that that a coalition war could be started against Brandenburg. After that, the player is recommended to lay low since high AE doesn't allow anymore expansion for a while. About 10 years of peace is recommended to get the AE down. Sometimes, with a newer patch, Brandenburg gets the opportunity to buy Neumark from the Teutonic Order for 100 Gold, which the player should accept. In the 10 years the player sits back and waits for AE to go down, it is recommended to prepare for war with Pomerania and attack around 1448/50. Attack, vassalise and make sure Stolp becomes a Brandenburg province, so there is a connection to Teutonic Order. At this point, the player can follow the first strategy on this page and expand towards the east, and into Denmark to the north. Its possible to get to number 7/8 of the Great Powers by 1500. It is strongly recommended the player focus on Admin Points. It is possible Brandenburg will get behind in technology, but with strong allies, Brandenburg can gain a ton of provinces with high development, and into the Great Powers for the extra 1/1/1 Points each month. With patch 1.25+ Brandenburg can use the mission tree for a different opener. Begin by allying two of Poland, Saxony, Bohemia, Austria or Denmark. Claim the Ansbach throne for an easy subjugation CB, with no aggressive expansion. Royal marry and guarantee Anhalt for a chance at a second personal union. Rival tiny HRE nations on the last day of November, to not give them the incentive to ally strong nations. For this reason do not rival Pomerania. When 12 Dec rolls around, declare humiliate wars on Lüneburg, Mecklenburg and so on. You should easily win, taking "Show Strength" in the peace deal for 300 monarch points and power projection. Peace out all participants individually for war reps, ducats, trade power and prestige. Save up the monarch points for tech. When the Renaissance spawns, develop Saxon provinces to 10 and Berlin to 20, hastening the institution. During this time, fabricate a claim on Neumark. By 1448, be prepared to attack the Teutonic Order. If Poland declare war on the Teutons before the Neumark event fires, immediately declare war and occupy the province. Either way, once Neumark is yours, take the mission reward for permanent claims on Pomerania. Your aggressive expansion should be near zero, allowing you to annex Pomerania in a single war. This should cause you to eclipse your tiny rivals, allowing you to choose new rivals for a second round of farming. Once your aggressive expansion has decayed a bit, use the permanent claims to declare war on the Teutons. Prioritise Konigsberg (to form Prussia) and Memel (to border the Livonian Order). Poland-Lithuania requires Danzig and Marienburg to form the Commonwealth. If Poland chose a Jagiellon and you want the Commonwealth in a personal union under you, sell Poland the provinces after completing the mission. The Livonian Order are a decent subject if they have lost land. Check you can vassalize them for under 100% warscore, then use their reconquest CB (usually against Denmark). Riga is Prussian so take it for yourself. Now established, you could play a tall Brandenburg-Prussia, become the Emperor, or expand into the remnants of Novgorod, Denmark, Bohemia or the HRE. If Lithuania explodes (usually due to Poland choosing a local noble, or badly losing a war), expand into Lithuania before Russia grows too strong. As money is a big issue for Brandenburg in the early years, to be able to get at least a small profit while at the same time maintaining a sizable army, it is recommended to raise the tax in Berlin to 9 and raise the tax in some other provinces by 2 or 3, as this lets Brandenburg earn a few extra gold per month, making it possible to have 1 or 2 Advisors. Building a church in the capital province and in other high administrative development provinces is also recommended. To increase trade income, it is a good idea to go for Hamburg, Lubeck, and to expand into Denmark (While at the same time managing their aggressive expansion), to get a good presence in the Lubeck trade node. Focusing too much on trade however may hurt Brandenburg's ability to have a strong fleet, as the focus would be on light ships, making the potential wars against Denmark significantly harder. If going for the route of conquest, dismantling the HRE when the emperor is weak would make expanding within Germany easy. When the time comes, France, Poland, Sweden and other powerful neighbors will be helpless against the Prussian military. This page was last edited on 1 February 2019, at 08:40.